I frequently get email from frustrated readers needing tech help. Occasionally their dilemmas are interesting enough to cover here in Hassle-Free Tech (see "Reader Q&A: Gmail Without Web Access, Too Much Security" for my last roundup). This week I try to help Greg, who is in turn trying to help his in-laws with a big problem. 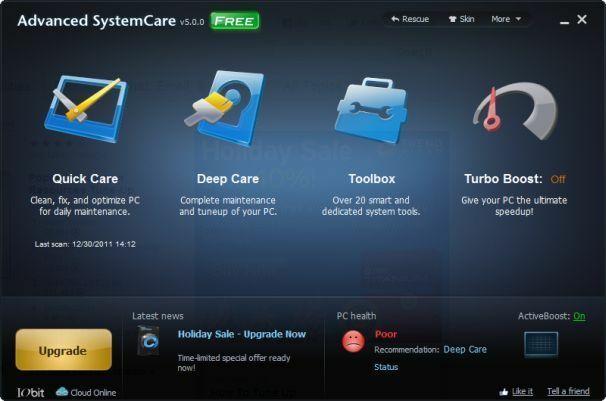 Also this week: I review Iobit's Advanced SystemCare 5 Free, which promises to clean out your Windows system and get it running faster. Reader Greg is trying to help his in-laws solve a pretty major laptop problem: "When it powers on, it comes to the login page and freezes. The mouse won’t move and I can’t type in anything into the password field. The disk access looks busy, which I know is typical when a PC starts, but even after it eventually slows down, neither the mouse nor keys will work. I tried firing it up in the various Safe Modes but the results are the same." That's what I always advise when people ask me about PC-optimization utilities like Ashampoo WinOptimizer 8 ($50) and CCleaner (free). While these tools can be helpful, they can also create problems--usually when users go overboard with the amount of "cleaning" they attempt.